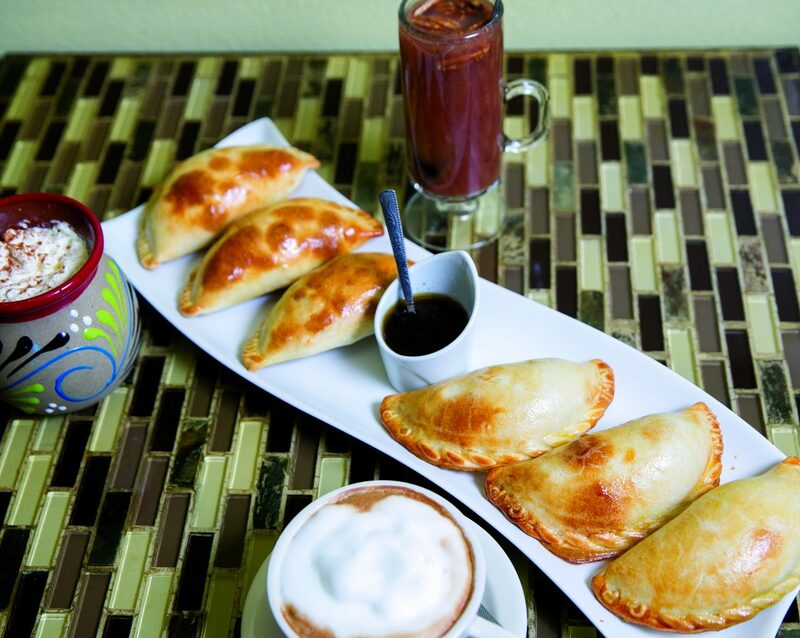 A winter warming meal from Kiwi International including a selection of freshly baked empanadas, a cappuccino, a Mexican style hot choclate with cinnamon and other spices and a ponches, a Mexican hot "fruit punch" with citrus fruit, apples and cinnamon. Kiwi International Delight and Coffee Co. is not your typical ice cream parlor. With between 50 to 60 flavors of house-made ice cream, sorbet, gelato and fruit bars offered daily — made with fresh, natural, organic ingredients and no processed sugar — the brightly colored cafe located in the heart of Avon may have the healthiest frozen dessert selection in town. Owner Martha Trillo boasts 170 different flavors, and using all-fresh ingredients, she creates unique sweet, savory and seasonal flavors, like the pumpkin spice gelato, kiwifruit fruit bars and avocado ice cream. She also offers dairy- and gluten-free options, using both almond and coconut milk in some of her desserts, as well as gluten-free ice cream cones. After a big day of flying through powder on the mountain, ice cream may not be the first food that comes to mind. Although this is what Kiwi International Delights and Coffee Co. is most known for, they also offer plenty of warming winter delights to heat you up before or after a cold day on the hill. The internationally-inspired cafe specializes in all-natural sweet and savory snacks and drinks from around the world. Start your day with a fresh organic juice or smoothie. For Trillo, who grew up in Mexico and never had soda in her house, fresh fruit juices and smoothies are part of her background. “The same fruits I use for the juices, I use for the sorbet. You can pick any of the juices or smoothies and I can make it into a sorbet or visa versa.” she says. If you need something a little stronger to kick-start your day, try one of the dozen international coffees, like the strong, sweet Greek coffee or a French cafe au lait: a shot of espresso topped with hot flat milk. This winter, Trillo added house-made empanadas to her menu. These Argentinian-style hot pastry pockets of goodness are baked entirely from scratch many times a day in a dozen different flavors. At $3.50 a pop, two hot empanadas with flavors like chicken and pesto, and a traditional meat variation with boiled egg and egg and chorizo are a quick, easy and filling meal on move. You can also order them by the dozen for parties, either hot or frozen to bake at home.